Johnny Stewart hit a brace in Saturday’s Intermediate Cup tie with Championship One side Ards at a cold Seahaven on Saturday. The on-form striker got a goal in each half, but it wasn’t enough to see Gary Taylor’s Championship Two side into the next round of the competition. Portstewart had a good first half playing some decent football. McNamee whipped in a cross that should have broken the deadlock and put the Seasiders in front early in the tie. Despite the dominance of the home team, it was John Convery who put Ards in front in the 37th minute. Stewart hit home on the stroke of half time to leave the scores level at the break. McAllister put the visitors in front on the hour mark, before Warwick grabbed a third to put the Championship side 3-1 in front. However the Ports never say die attitude kicked in, as Nigel Turner fired a powerful shot over the bar. It was Turner’s striking partner, Stewart who set up a nervous finish to the tie when he rolled the ball past McKibben to make it 3-2. Despite their persistence Portstewart couldn’t find a third. Ports Assistant Manager Aaron Forgrave was pleased with the display his side put in against opposition in the league above. 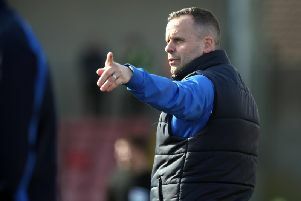 “Ards are a good side, they are sitting third in Championship One and are pushing for promotion, but credit to our boys they put in a good shift and battled hard. Portstewart were without five regulars for the tie, Stuart Millar, James Peden, David McClements, Luke Bradley and Dean Murray. Forgrave went on: “We had a weakened side with players out through suspension, injury and James Peden had a bereavement in the family. “I think if we had fielded a full team we would really have won the tie. Of course Portstewart have their name in the hat for tomorrow’s (Wednesday) Irish Cup draw, after beating Newry City last Saturday. Ports boss Gary Taylor is hoping for a home draw against one of the big teams. “I know when I was playing I always liked to play against the big teams, so it would be great to get a home draw, get the ground filled and have a good day. We’ll bring you the full Irish Cup draw on our website on Wednesday, log on to colerainetimes.co.uk, or follow us on twitter @coleraine_times.